SAN FRANCISCO, Calif. (March 29, 2016) — Royal Robbins’ commitment to environmental and social responsibility dates back to the brand’s birth in the Yosemite Valley in 1968. Today, thanks to newly appointed CEO Michael Millenacker, Royal Robbins is doubling down on its founder’s original commitment to environmental preservation by signing on as a bluesign System Partner. Iconic rock climber Royal Robbins was one of the first and most vocal proponents of clean climbing. In 1967, he and his wife, Liz, made the first ascent of Nutcracker in the Yosemite Valley using only removable nuts for protection. It was the first climb of its kind in the United States. In May 1967, Robbins advocated using nuts rather than pounding pitons into the granite cracks in his seminal article in Summit Magazine. Royal Robbins is committed to minimizing the environmental and social impacts typically associated with apparel production. Royal Robbins partnered with bluesign in order to evaluate and reduce its textile production and manufacturing chain’s environmental impacts. Millenacker will work with factory partners to improve performance and reduce impacts in resource and energy productivity, consumer safety, water emissions, air emissions, and occupational health and safety. Royal Robbins has long adhered to a detailed Code of Conduct and requires that its manufacturing partners be committed to the same principles as well, including ethical standards, fair labor practices, anti-discrimination measures, and environmental safekeeping. To ensure compliance, Royal Robbins conducts annual audits through third-party social compliance auditing firms. 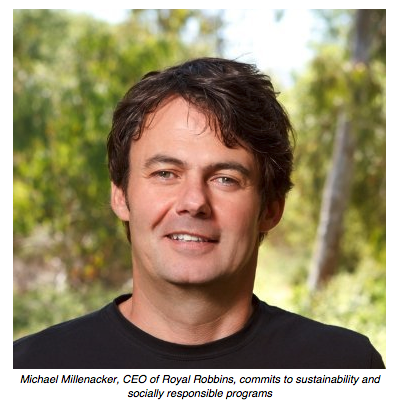 Millenacker knows firsthand the importance of environmental and social responsibility to the Robbins’ and their brand. He served as Royal Robbins’ director of sales and marketing in the 1990s, reporting directly to Royal. In late 2015, he returned to the heritage brand after serving as president of Eagle Creek and vice president of sales at The North Face. Millenacker is committed to following in the Robbins’ footsteps and extending this responsibility ethic to all aspects of the heritage apparel brand. In January 2016, Millenacker signed the Outdoor Industries Women’s Coalition’s CEO Pledge to support a more sustainable industry built on gender diversity and inclusiveness. Royal Robbins’ collection of men’s and women’s products can be found in outdoor and specialty retail partners throughout the U.S. and abroad.